It didn’t seem fair. Ten-year-old Chris Chicas, one of the smallest players on this concrete pitch, was made to play goalkeeper in a 6 vs. 6 pickup game that featured teenagers double his size. But Chris hardly cared. With his hair pulled into a bun with a yellow rubber band and sleeves rolled up to his shoulders, Chris welcomed being in the crosshairs, his body language exuding a confidence that told everyone that he belonged. 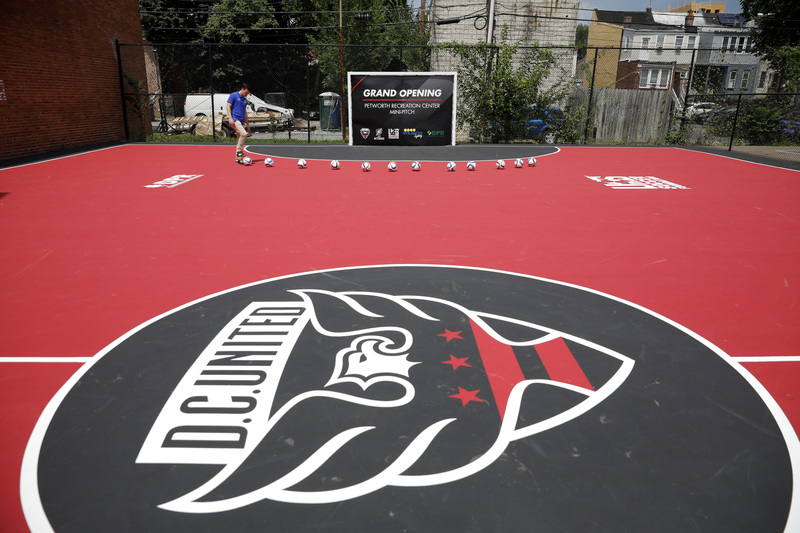 The D.C. United team logo on the new soccer mini-pitch at the Petworth Recreation Center in Washington, D.C., on Aug. 6. “I think it’s really nice because mostly people that live near Petworth have to drive either 20 to 30 minutes all the way to a field so they can play,” said Chris, who lives in nearby Fort Stevens, about 10 minutes from the Petworth Recreation Center. The pitch opening was attended by youth soccer players such as Chris and Axel, a defensive midfielder on his middle school team, who are members of DC SCORES, a local philanthropic group that organizes neighborhood teams and runs Soccer for Success, the U.S. Soccer Foundation’s after-school soccer program. Kids participate in scrimmage after the unveiling ceremony of the new soccer mini-pitch at the Petworth Recreation Center in Washington, D.C., on Aug. 6. 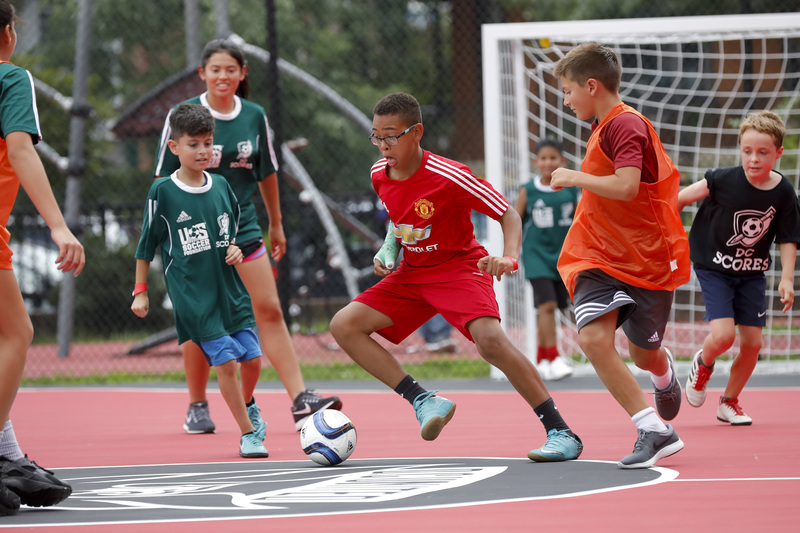 Free to the public, the new mini-pitch is part of the U.S. Soccer Foundation’s It’s Everyone’s Game program to ensure that children in underserved communities can enjoy the game. “In my mind, I have no doubt that one day there’ll be a kid playing at a high level who will say, ‘I got my start playing in the neighborhood Soccer for Success Program at my school,’ ” said Ed Foster-Simeon, president and CEO of the U.S. Soccer Foundation. The foundation’s goal, Foster-Simeon said, is to engage 1 million children annually in Soccer for Success by 2026 and build 1,000 new safe places to play at a cost of $65,000 per pitch. A former newspaper editor whose passion for soccer started three decades ago when he signed up his 4-year-old to play, Foster-Simeon said making the game available to the inner city will build affinity that could ultimately affect the game even as high as the national team level. “That doesn’t mean that every kid is going to play soccer, just like every kid doesn’t play baseball, but they get a chance to sample and experience [the game] and make a decision for themselves,” said Foster-Simeon, who said 34 percent of participants in the program are African-American, 50 percent Latino, 7 percent Caucasian, 6 percent other or multi-ethnic and 3 percent Asian. 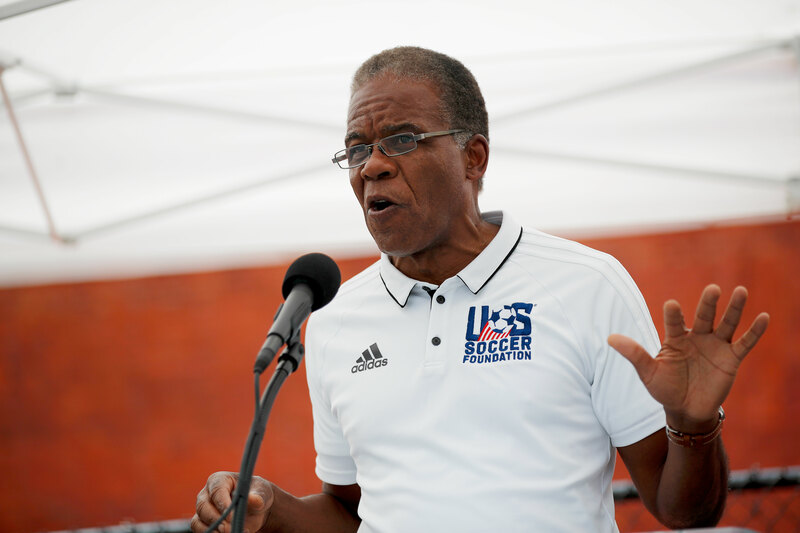 Ed Foster-Simeon, president and CEO of the U.S. Soccer Foundation, speaks during the unveiling ceremony of the new soccer mini-pitch at the Petworth Recreation Center in Washington, D.C., on Aug. 6. While soccer is a growing sport in America — popularity has tripled in the last decade — it still ranks fourth among the major sports, according to a recent Gallup poll. And, while “the beautiful game” polled ahead of ice hockey for the first time since 2013, until boys and girls in the ’hood play the game regularly, bringing their rhythm and culture with them, soccer will remain fourth for a long time. It’s still hard for some to fathom that a country of 325.7 million people and endless resources can’t be better at the sport and consistently good enough to qualify for the World Cup. It’s not like American kids aren’t playing. As of 2006, the U.S. was the No. 1 country in the world for participation in youth soccer, with 3.9 million players (2.3 million boys and 1.6 million girls). To be clear, the pitch initiative isn’t a feeder system for the U.S. national teams. Chris Odoi-Atsem, a second-year defender with D.C. United, can identify with the kids chasing balls and taking shots on the new, freshly painted goals. Born and raised in Prince George’s County, Maryland, Odoi-Atsem came through soccer’s club environment, playing for Bethesda Soccer Club while attending Holy Trinity Episcopal Day and DeMatha Catholic High School before playing at the University of Maryland. The biggest takeaway for Odoi-Atsem as an honorary coach at the pitch unveiling was the chance for kids to be introduced to the game in a free-play environment that doesn’t come with soccer’s “pay to play” model, where the costs for travel soccer run anywhere from $500 to $3,000 a year. 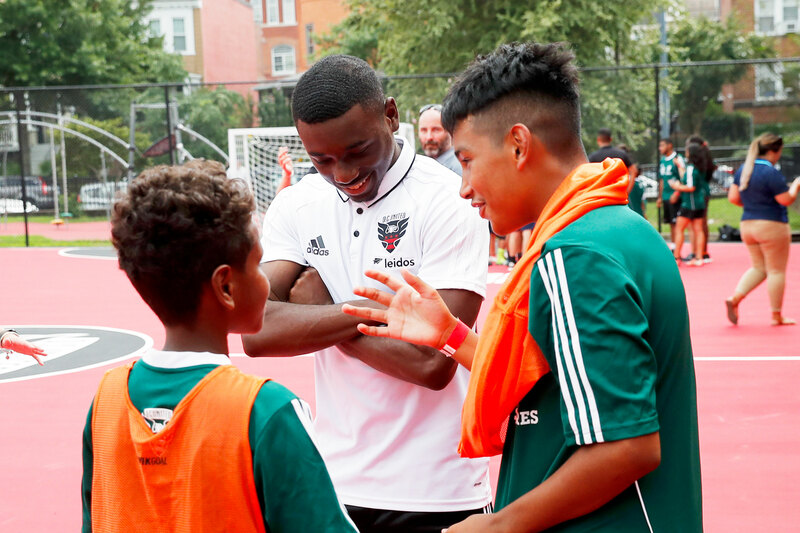 Chris Odoi-Atsem (center), who plays defender for the D.C. United, interacts with kids after the unveiling ceremony of the new soccer mini-pitch at the Petworth Recreation Center in Washington, D.C., on Aug. 6. Twelve-year-old Fatou Gaye is torn. She likes soccer, but loves basketball. Gaye, along with her brother, Amat, and mother, Kadidiatou, came to America in 2014 from Mali in West Africa. Tall, with an athletic build, Fatou has been playing soccer since the fourth grade and is now a defender on her middle school team. The Gaye kids live about 10 minutes from the new Petworth pitch — which, luckily for Fatou, also has an adjacent basketball court. Kids line up to pair up as teams for scrimmage after the unveiling ceremony of the new soccer mini-pitch at the Petworth Recreation Center in Washington, D.C., on Aug. 6. Two more pitches are planned for September in Seattle, and 10 additional ones, in partnership with Target, are slated for the fall. Access creates opportunity, which leads to endless possibilities. Sounds like a great new pitch.